We love German car brands so much, and so we have so many lessons about Mercedes-Benz, BMW and Audi. 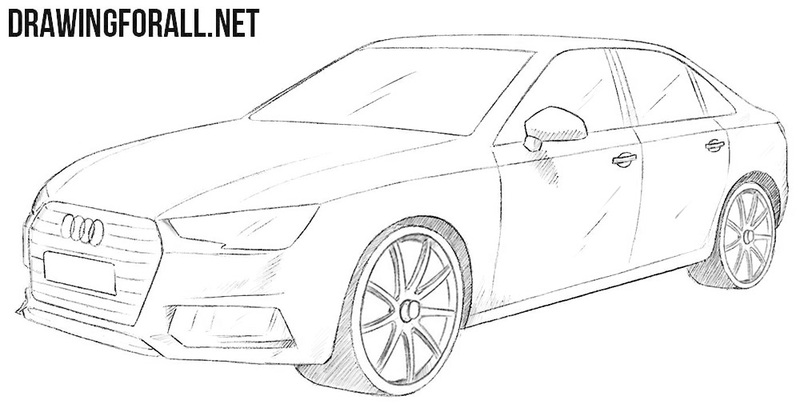 And the topic of cool German cars will be continued in this lesson on how to draw an Audi A4. 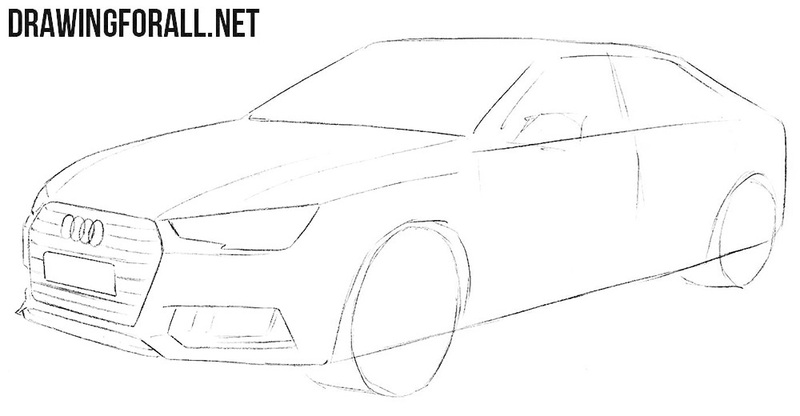 In order to draw a smooth, symmetrical and beautiful Audi, we first need to outline the main contours of the car body. So sketch out these very contours with very light lines, as in our example below. The main contours are outlined, but our car now looks more like a box. In order to make it look more like a car, let’s outline the details. With the help of light lines we sketch the outlines of the radiator grille, headlights, rear-view mirrors, doors and wheels. 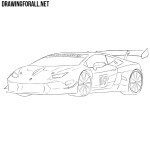 So, the most basic contours and details are done, let’s now proceed to a more detailed drawing. 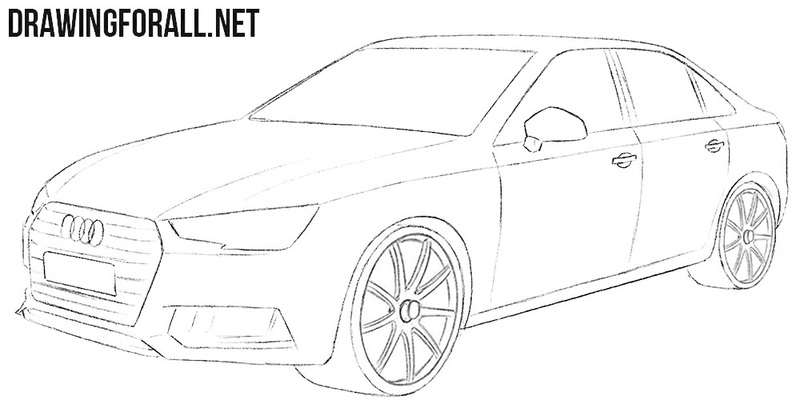 First of all, using dark and clear lines, draw the outlines of the radiator grille and Audi’s angular headlights. Draw the Audi sign and a registration plate. This will be a fairly simple step. Here, using clear and dark lines, we draw the contours of the hood. 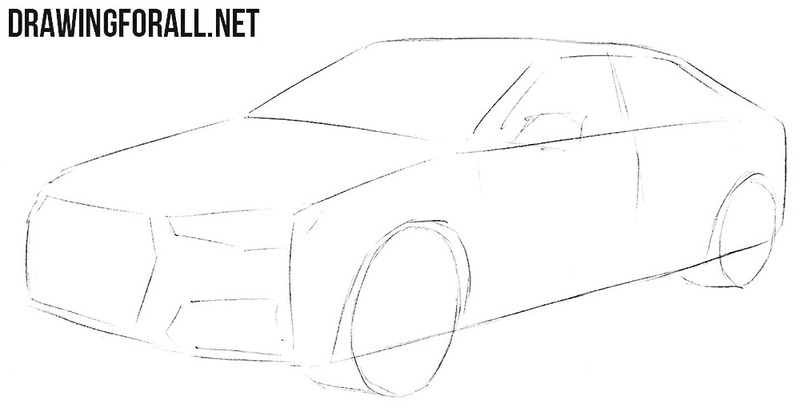 Next, go to the bumper and draw out the fog lights and the lower edge of the bumper. Remove all unnecessary guidelines from the front of the Audi A4. Continuing the lines of the hood gently draws out the roof, which flows smoothly into the back of the car. Next, draw the lines of the windows. After that, draw the rearview mirror and delete all unnecessary lines from the top of our Audi. 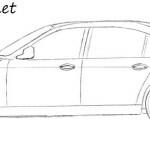 Continuing the long roofline, we draw the visible rear of the car. Then continuing the line of windows draw out the doors. On the doors we draw the handles. 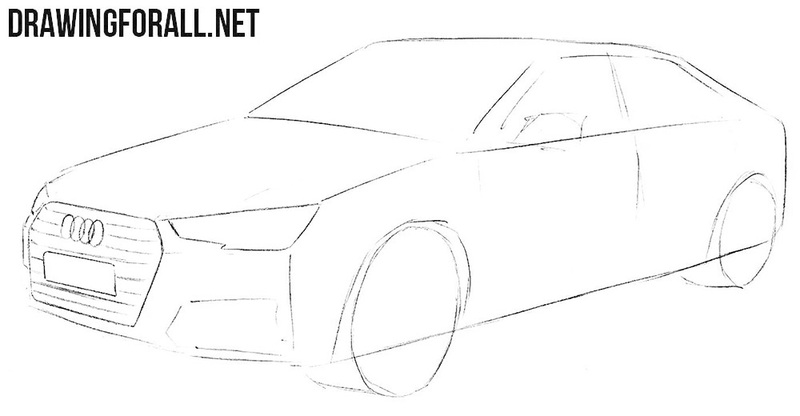 Next, draw the bottom edge of our Audi and remove unnecessary lines from the body. This is probably the most difficult step of the tutorial on how to draw an Audi A4. 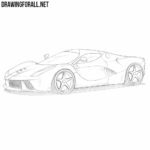 Here we will need to draw the wheels and rims. 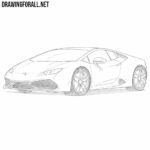 When drawing wheels, be especially careful to make them as smooth as possible. No less care should be when you draw rims. The drawing of the Audi is almost done, and the lesson is almost complete, but in order for our Audi A4 to look more realistic in volume, we will add some shadows. Use dense hatching to add shadows, and long strokes to sketch highlights on glasses. 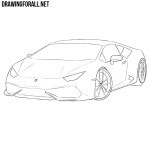 As we have already said in other drawing lessons, there is an indisputable plus in drawn cars, since you don’t have to worry about insurance or expensive gasoline (or in extreme cases you can draw it all). 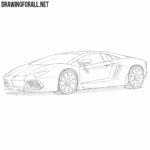 But seriously speaking, we hope that the knowledge of our artists was useful to you, and you were able to learn how to draw an Audi A4 with the help of this lesson. Thanks for that. I liked it.